These butterflies are very easy and tasty. Kids will surely like these. 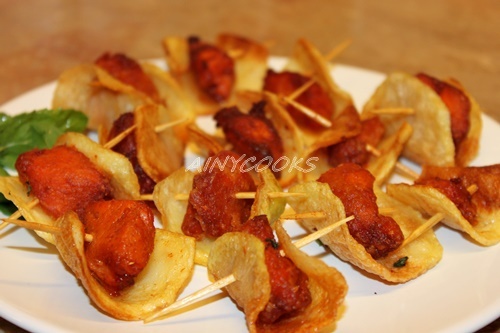 Can be a perfect finger food for parties. Peel potatoes and cut into thin slices length wise. Add 1 tsp vinegar in water. Soak in water for 1-2 hours. 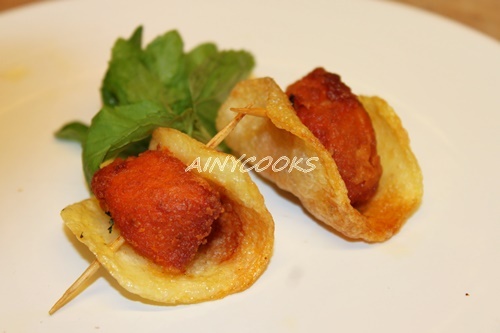 Marinate chicken with Tandori masala, lemon juice, butter and ginger garlic paste. 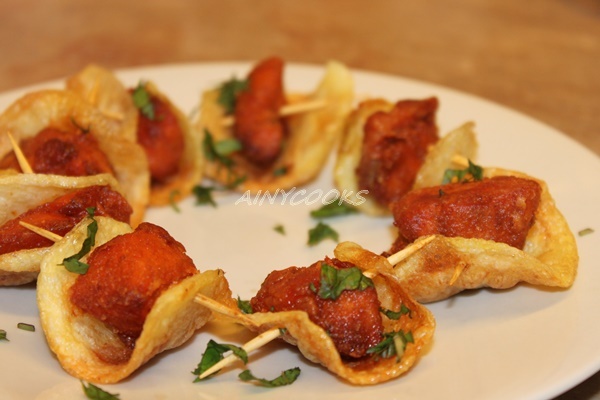 Before frying sprinkle corn flour and flour on chicken pieces. Toss them. 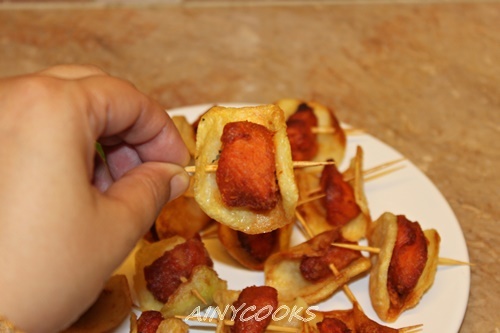 Place chicken in center of the slice and insert toothpick, secure it and fry in oil. Take butterflies out when chicken and potatoes tender. Place on paper towel. Sprinkle coriander and grated cheese just before serving and serve with sauce. Serve hot immediately otherwise it will become soft. SPICY CHICKEN BROAST THREAD CHICKEN STICKS CHICKEN CORN SOUP WITH GARLIC STICKS CHICKEN TIKKA BREAD BALLS POTATO SLIMS/ STICKS IN MICROWAVE KFC – FRIED CHICKEN CRISPY CHEESY SANDWICH CORN RICE WITH CREAM CHICKEN SAUCE.